Planners can influence child care programs by creating policies, identifying local resources, and working with developers and community partners. For example, long-range comprehensive plans, zoning codes, and permitting practices can facilitate or inhibit the development of child care centers and homes. 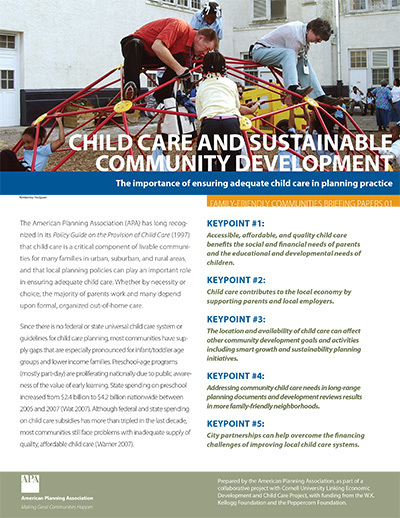 Through five key points, this briefing paper explores the social, economic, and environmental benefits of a robust local system of child care and early education programs for the child, family, and community. It provides useful examples of policies, strategies, and on-the-ground child care projects for planners seeking to enhance child care services to build family-friendly communities.